Guy Sheppard currently leads the Asia Pacific Shared Services Initiatives teams, having joined SWIFT in 2014 with over 12 years of experience in compliance, predominantly in servicing law enforcement and correspondent banking KYC. He is responsible for driving the take up of the financial crime, business intelligence and reference data portfolios across the region. The community typically engages with the SWIFT Shared Services teams to drive transparency and standardisation of processes, provide assurance to existing controls, as well as enable business critical insights to determine market share, growth and risk. 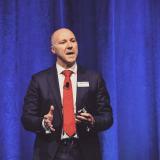 Prior to leading the Asia Pacific team, Guy was responsible for financial crime compliance initiatives across the Americas, UK and Nordic regions. In his career, he has worked for LexisNexis, Wolters Kluwer Financial Services, Bankers Almanac (now Accuity) and with the Metropolitan Police NTFIU on an industry joint-venture. Check out the incredible speaker line-up to see who will be joining Guy .